The Lada Niva 4×4 from Russia has received considerable coverage on this site, including of rare variants such as the pickup truck and cabriolet. Never sold in the U.S., the Niva has been highly popular in its native Russia and even achieved considerable export sales, the result of its low price and widely respected off-road capability. 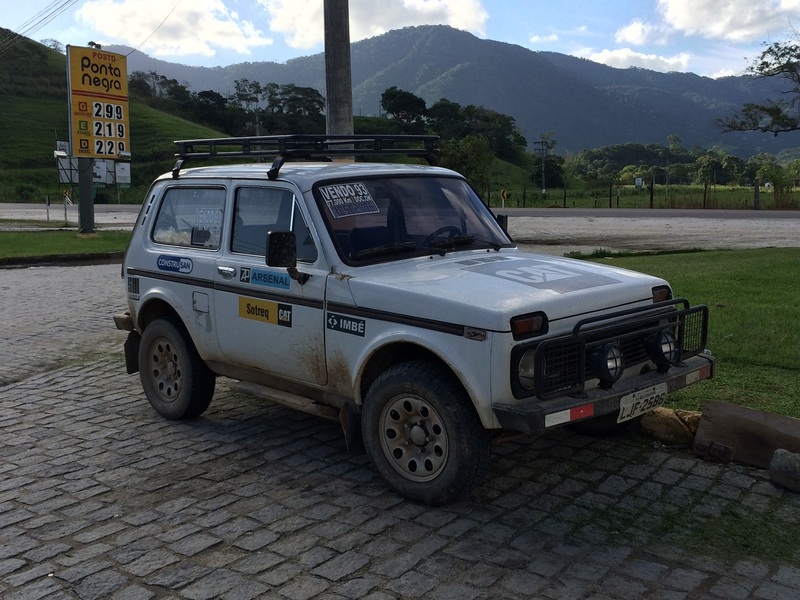 Already knowing this background did not reduce the shock of actually seeing a Niva for sale by the side of a rural road in Brazil, apparently well used but also well kept. The presence of this and thousands of other Nivas in Brazil came about from a coincidence of Soviet economics and Brazilian trade policies. The Soviet auto industry introduced the Niva in 1977 as a simple and cheap but highly capable off-road vehicle, with the engine of the Fiat 124-based Lada sedan and a new two door wagon unit body, four wheel drive system with high/low range gears and center differential lock, and coil spring suspension front and rear, independent in front and with a solid axle in the rear. Brazil up to 1990 protected its domestic auto industry by keeping out all foreign cars, but that year it began to allow imports, still with heavy tariff protection. 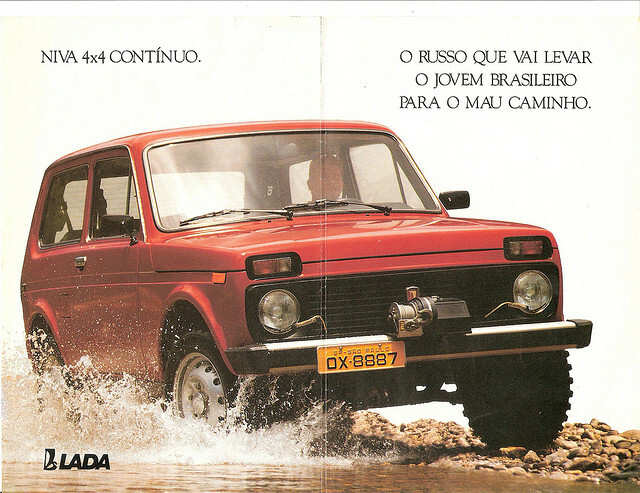 Lada jumped into this opening quickly and became the first foreign auto manufacturer to enter the Brazilian market. 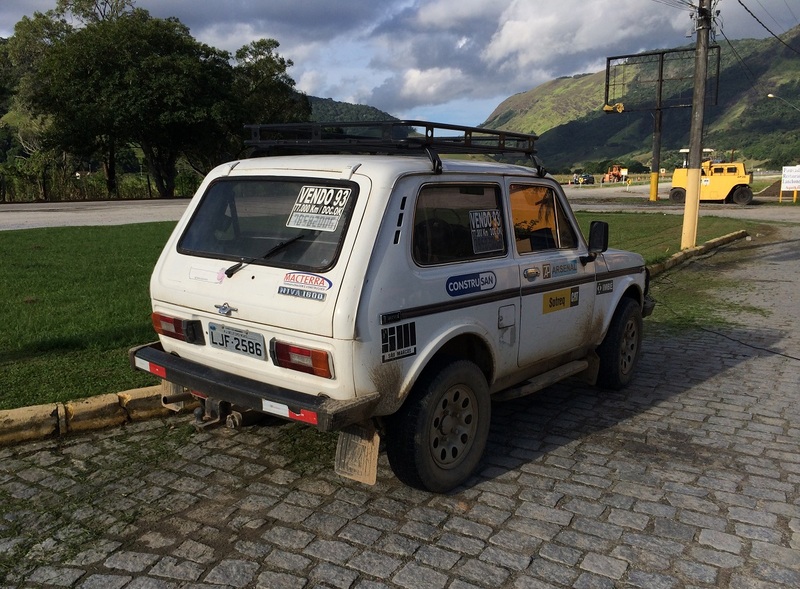 The Niva had off-road capability superior to Brazilian equivalents and undersold them even with import taxes added, so it immediately became a sales success. 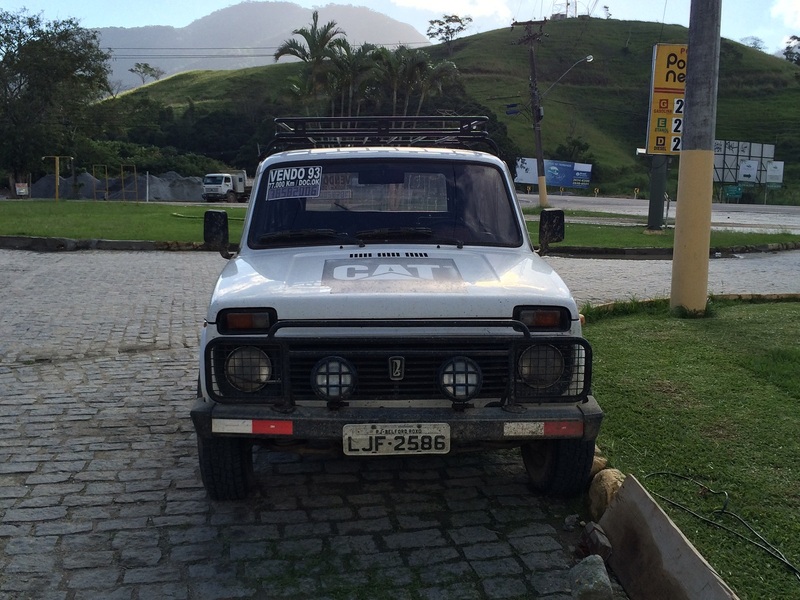 Lada sold the Niva in Brazil until it left the Brazilian market in 1997. Already equipped with a bull bar, driving lights, roof rack, and plenty of sponsor decals, this Niva is a tiny yet still rugged looking vehicle. With the earliest 1990 imports approaching the 25 year threshold that makes foreign vehicles exempt from most Department of Transportation regulations and easier to import into the United States, it may be a tempting relic of the Cold War to import into the U.S. as a useful and characterful antique SUV. If you are interested, here is the telephone number of the seller. 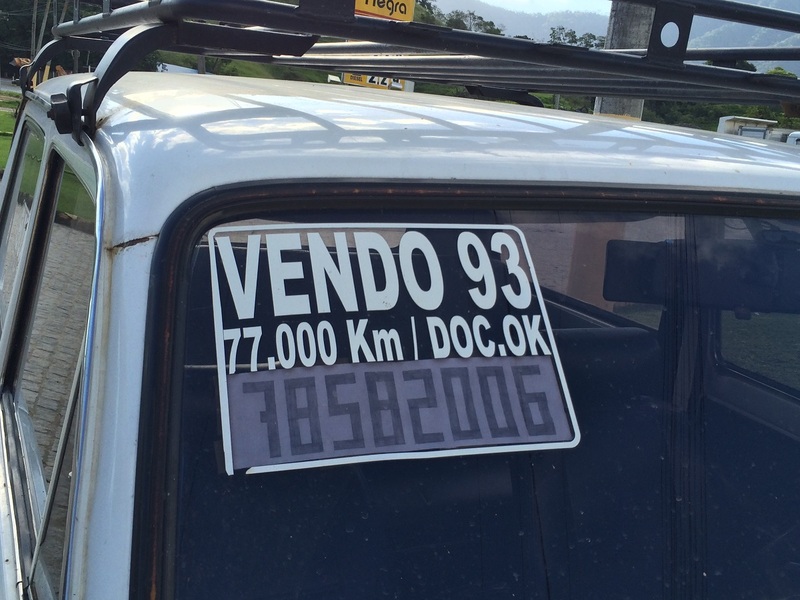 With claims of only 77,000 kilometers and all proper title and registration documents — the latter apparently not always present for vehicles in rural Brazil — it appears to be a far better than average survivor. Anyone excited by the idea of buying a Niva and bringing it to the U.S. may want to wait a few years, though, because the Niva story has not ended yet. 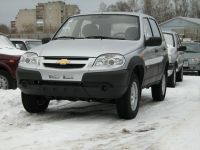 It took a new form unimaginable when the Niva was new in 1977 with the introduction in 1998 of the Chevrolet Niva, a further development of the basic Niva design by a joint venture between GM and AvtoVAZ. 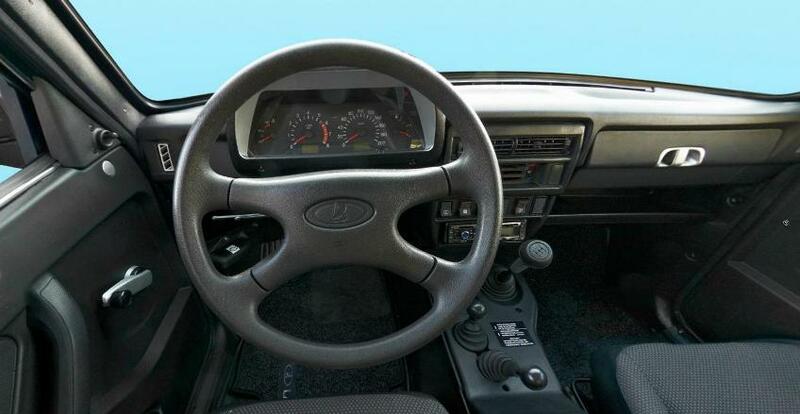 It took the Niva’s original engine, transmission and chassis and put a new four door body and interior over them. 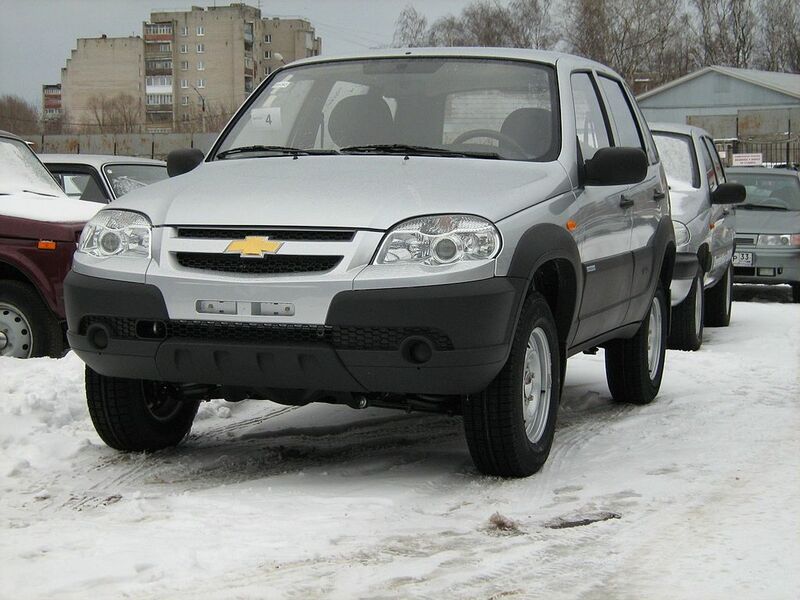 It has continued in production into 2014 for the domestic market in Russia, modernized with ABS, dual airbags and other features. So in 2023, you should be able to import an antique Niva made by General Motors and wearing a Chevrolet bowtie. Whether you prefer the Soviet original or its Russian-American successor as your modest yet exotic Eastern European import is up to you. Once a popular and honest 4×4, I especially remember the ones with the 1.9 liter PSA diesel. In Germany you can still buy a brand new old-school Lada Niva: the Lada Taiga 4×4. 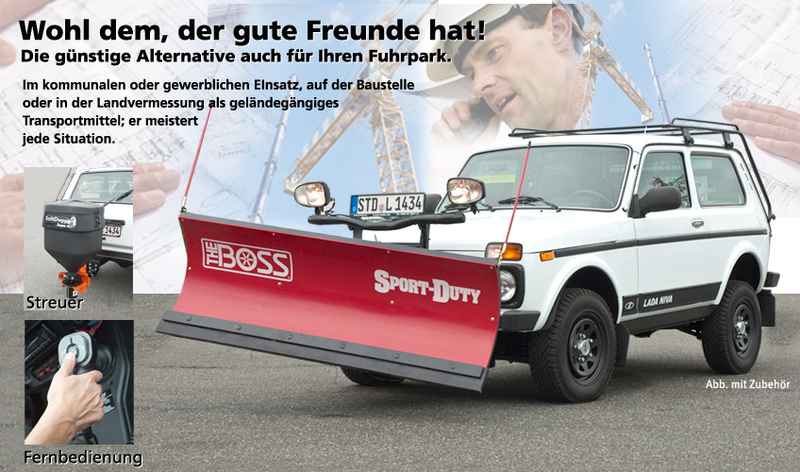 From the same German Lada website, ready for the next Siberian winter ! I’ve been interested in the Lada Niva forever. It’s unforgivable that it was never sold here in the USA. Even with tensions between the USA and the Soviet Union, I would think that the vehicle would sell well. I would’ve bought one if it were available. i would change the name from Lada to something more American, and provide user instructions in English to make it easier to use. But the car itself should be good. That’s awesome, I’ve always liked the looks and the idea of these. I have never seen one in the flesh though. Is it about the size of the original Rabbit or is it larger or smaller? Sizewize it’s about on a par with a Golf / Rabbit, possibly slightly larger. Had one of these back in the mid-’90s – if memory serves it was an ’87, and was the upmarket (such as you can be with a Lada) UK-spec Cossack model, complete with bull bars, spotlights on the front bumper, and *very* late-’80s stripes and ‘Cossack’ graphics on the sides. From reading the article, ‘honest’ is an excellent description of these vehicles. Power nothing, no A/C (though I understand some South African models got that, but had oiling problems due to the drag of the A/C compressor when engaged), noisy cabins (especially over 50mph), and acceleration that was best aided by travelling in the direction of the earth’s rotation were the norm. That said, it’s one of the best vehicles I’ve ever owned having been reliable, unstoppable in the dirt, and dead simple to work on. Never had a diesel so can’t speak to them; mine was the carburetted 1600cc petrol model, and as far as I know that engine was unique (as was the later 1.7i based on the 1600) to the Niva; none of the saloon cars received it. That said, the spec on Lada’s export models was quite different to what was offered on the home market (and was sometimes partly-decided by the individual importers in each country), so it’s possible that my experience with the UK & Irish markets doesn’t completely align with what was going on in the rest of the world. Also from memory: the 1600 was derived from the 1200 / 1300 / 1500 engines in the Riva saloons, but was far-enough removed from their Fiat origins that there wasn’t a huge amount of cross-compatibility. As a result, there have been Lampredi conversions on Nivas (and years before Top Gear did their swap on the Riva), but it’s not a straight drop-in. And while I’ve never driven one with that engine installed, I do question the utility of an off-road vehicle that has a relatively narrow torque band higher up in the rev range. The original 1600cc engine put out something in the neighbourhood of 75bhp, so low gearing was used to get it off of the line; mating that to a Fiat twin-cam would make for an interesting driving experience both on-road and off-. If you’re in North America and looking for one, there are 25-year-eligible cars available in Canada (where they were sold from the early-/mid-’80s up into the ’90s), but rust is the enemy on those vehicles. If you do snag one, though, pretty much all parts are available if your Russian is up to par or you’re willing to go through one or two places in Canada to get them. Fantastic vehicles, and in my opinion very much overlooked in lists of the world’s greatest cars. Definitely a product of the time and place in which they were designed and built, but quite radical for the time in some ways and just utterly durable. I’ve owned a few. They are marginally bigger than the Suzuki Sidekick and Chevrolet/Geo/GMC Tracker. Check out those gas prices!! That’s per Litre folks!!! Wouldn’t it just be easier to import one from Canada? They sold them here for a few years. They used to be quite common, since they were cheap and relatively capable. I see one every now and then, but they are getting thin on the ground. I think they all rusted out. Here’s one for sale in Nova Scotia, and since it’s a ’88, you can import it into the US right now. From the mid-90s to the mid-00s, whenever I went to Canada, whether it was just across for poutine at one of the restos on Quebec Route 133 or a long weekend in Ottawa, I would see one Lada. No more, no less, and never the same one. Percentagewise I’d say 40-40-20 Samara-Niva-Fiat based RWD car. As long as you got a good one they were ok many were scrapped new for parts as driveline vibration could no be eliminated, I looked at buying one several years ago it had a jammed centre diff, I went and saw a mechanic I knew had worked for the Tasmanian importer he explained what needed to be done to fix it and the special tools required to reassemble it and I didnt bother buying it wasnt the diy friendly project I was hoping for. IIRC, Russia also had a modern version of the Fiat based Lada Niva. 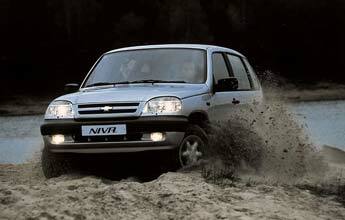 They call it the Chevrolet Niva just like the photo that I have posted here. These were quite attractive cars and good off road too. I was in Moscow in 1984 and it seemed you had made it if you were driving a Niva, Russia’s answer to the Range Rover. Once a common sight here, along with the Lada Samara and Polish FSM Niki. Australia received an influx of cheap Eastern Bloc cars in the late 80’s to early 90’s. I haven’t seen any of these cars for many years, but I’m sure there’s a few kicking around out there somewhere. I’ve heard the Niva is a surprisingly capable off roader. They were paying for the Ladas with wheat (as opposed to currency) at one stage! I don’t mind these but I think I would have to be a lot keener on offroading to own one. I have friends who had or have the original variants of Lada Niva’s. Another one a former student friend mine who apparently lives in one of the republics of the former USSR has the new Chevrolet Niva. All of them are satisfied. Reliable is the main opinion. Lots of so called special editions appeared on the market of different export markets like the long wheelbase hardtop, pick-up for 5 passengers and the long wheelbase CIT car versions. Some original Lada Nivas appeared with fancy plastic trims, nudge on the front paired with foglights and smooth body decorations. I was working for a week or so in Vina del Mar, Chile in 1990 and hailed a taxi at a restaurant for the short trip back to my hotel. My draw – a Lada four door sedan that seemed to be some old Fiat tooling. With my bad attitude about both the USSR and subsequently Russia, I refused to get in that car. Next car was a ’68 Oldsmobile Cutlass four door sedan and I was perfectly happy to ride back to the hotel in that. Thus ends my only Lada knowledge/experience. I’ve had two of them. They are not refined in any way, but somehow, when you have had one…, it just stay’s in your soul and is allways missed like an old friend. I wish I could get this , I prefer lighter colors anyway . I understand the attraction of these 100 % ~ old tech design ,not fancy but as mentioned gets into your heart easily .